We just returned from a ski vacation to Colorado. We found plenty of snow and plenty of people at the mountain and in the shops and restaurants in town in the middle of the week, too – in spite of frigid temperatures with a wind chill factor below zero. That’s pretty impressive, considering that we’re in the midst of the worst recession in 100 years and lift tickets sell for nearly $100/day. Wouldn’t it be nice to have your own personal business advisor – someone you could call with a new business idea or strategy? Would you like someone you could bounce ideas off – a senior, seasoned professional – without incurring a bill every time you picked up the phone or sent an email? 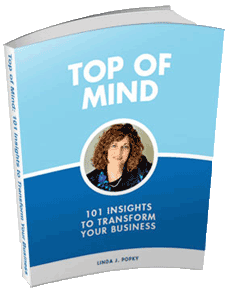 We are proud to announce that Linda Popky is one of only 20 people certified worldwide to offer the Private Roster Mentor Program developed and offered exclusively by Million Dollar Consultant Alan Weiss. Over 1000 people have participated in the program over the last 15 years, with returns conservatively estimated at over $660 million. If you’d like expert help to take your business to the next level, consider this six-month new program available for a low fixed fee. Hear what Alan Weiss has to say about Linda Popky. Our popular teleseminars offer an easy way to learn about the latest marketing strategies, trends, and techniques – without ever leaving your office. This year’s series includes sessions on a wide variety of marketing topics of interest to consultants, small businesses, and nonprofit organizations – from starting and building a business, to branding, marketing strategy, and building your personal brand. Teleseminars are available as individual sessions or at a reduced rate in a series. Not able to make the live session? No problem. Our sessions are recorded and available to you as downloadable MP3 files. 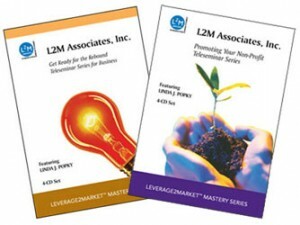 Our fall 2009 teleseminars are now available as MP3 files or on CD. Choose either the Non-Profit Series or the Small Business Series. Each includes four full hour long sessions for one low price. 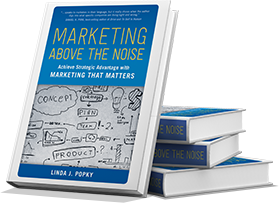 BUSINESS MARKETING ASSOCIATION (BMA) MARKETING STRATEGY ROUNDTABLES DEBUT THIS MONTH, JANUARY 26, 8:00 A.M.
Mark your calendar for the first Business Marketing Association Marketing Strategy Roundtable breakfast meeting on Tuesday January 26th in Palo Alto with Linda Popky as your host. Modeled on BMA’s successful series of roundtables on product marketing, branding, and other marketing areas, the new series will feature dynamic speakers focused on marketing strategy topics of interest to Silicon Valley marketing professionals. Meetings include breakfast and will be held the last Tuesday of each month at 8:00 am at Scott’s Seafood Restaurant in Palo Alto, starting Tuesday, Jan 26th, 2010. 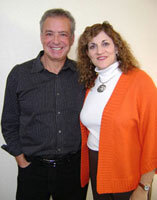 Leverage2Market’s Linda Popky interviewed Million Dollar Consultant Alan Weiss for Women in Consulting in January. Linda was a panelist at the Women’s Economic Summit sponsored by the Cadera Center for Women in San Jose in September. Linda presented the seminars Standing out from the Crowd: Marketing Strategies to Build Thought Leadership and Big Marketing Tips for Small Businesses: Building Your Business on a Limited Marketing Budget at Keypoint Credit Union in Santa Clara in October. Linda moderated the panel “Has Silicon Valley Lost Its Buzz?” featuring four local mayors and sponsored by the Silicon Valley Young Professionals and Keypoint Credit Union in December. Linda was interviewed by Seth Kahan, for his Freelance Fortune podcast series, and by Celeste Bishop for her OnCompeting blog. We are in the process of booking our Spring ’10 speaking schedule. If your business or association could use a dynamic, thought-provoking presentation or workshop on marketing or business strategy, please contact us. Our goal is to offer the value we provide to as many people and organizations as we can. Our business is 100% referral-based, which means we rely on people like you to tell others about the types of results they can get from working with us. If you know an organization that could benefit from more impactful marketing programs, processes, or people, please let us know.